Mix the pepper, garlic, olive oil, lemon juice and green chillies to make the dressing. 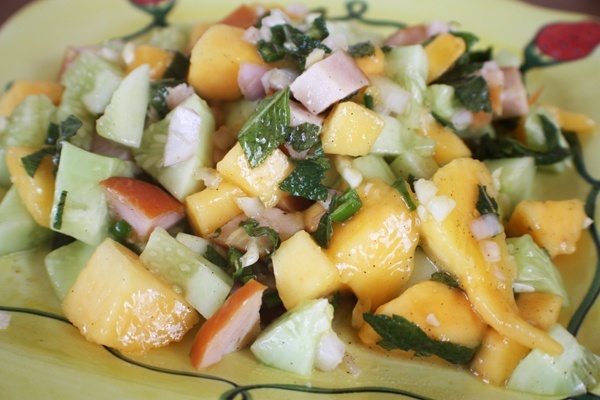 Mix the Mango , cucumber, smoked chicken, Mint and onion in a bowl. Pour the salad dressing on top and mix well. Add salt as per taste. Chill in the fridge for about half and hour and serve cold. This entry was posted in All Recipes, Salads and tagged Smoked Chicken Salad by Kamakshi. Bookmark the permalink.